No fire spots are visible by the evening but the territory is covered in smoke. A fire broke out at the 65th arms depot at military unit No 1652 in Balakliya, Kharkiv Region. Hromadske initially quoted the local mayor as saying that the fire took place as a result of a scheduled explosion of ammunition. The State Emergencies Service confirmed the reports about the fire. According to the General Staff of the Ukrainian Armed Forces, the fire broke out at a "former warehouse in Balakliya". 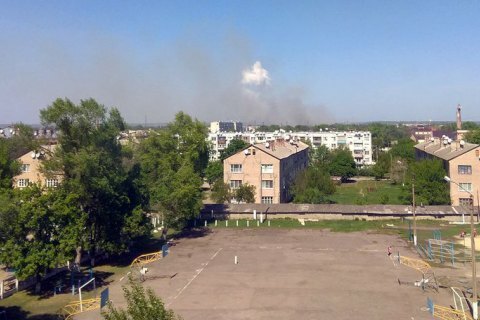 "At 1.35 p.m. on 3 May, a fire broke out as a result of dry grass catching fire in the former technical area of the 65th arsenal in Balakliya, Kharkiv Region, where efforts continued to clear and demine the remaining shells, which did not explode during the last year emergency," it said. Two fire tanks were involved in extinguishing efforts. The personnel were evacuated. The Defence Minisry said there were no explosive works held when the grass caught fire. The reasons for the fire are being investigated. Its spokesman Dmytro Hutsulyak told 112 Ukrayina TV said that there had been 40 explosions by 3.30 p.m., but their intensity has subsided. The head of the Kharkiv regional state administration, Yuliya Svitlychna, said efforts were underway to evacuate residents from the areas adjacent to the arms depot. "The situation is under control. Evacuation of the entire town is not on the agenda. Arsenalna Street and the adjacent blocks of private houses are being evacuated," she said. Police have restricted access to the town, its press service said. "We let everybody out and nobody in, except for armoured and technical vehicles. Some exceptions are made for people coming to pick up their relatives," press officer Viktoriya Lyuta said. In the evening, the General Staff said that there were no hot spots visible in the area of Balakliya, but the territory was covered in smoke. On 23 March 2017, a fire broke out at the largest arms depot of the Defence Ministry in Balakliya, causing the detonation of 125-mm and 152-mm tank and artillery shells. One person was killed and two were injured. There are over 100,000 t of ammunition at the arms depot. The most dangerous ones are Akatsiya self-propelled howitzer shells with the range of up to 20 km.